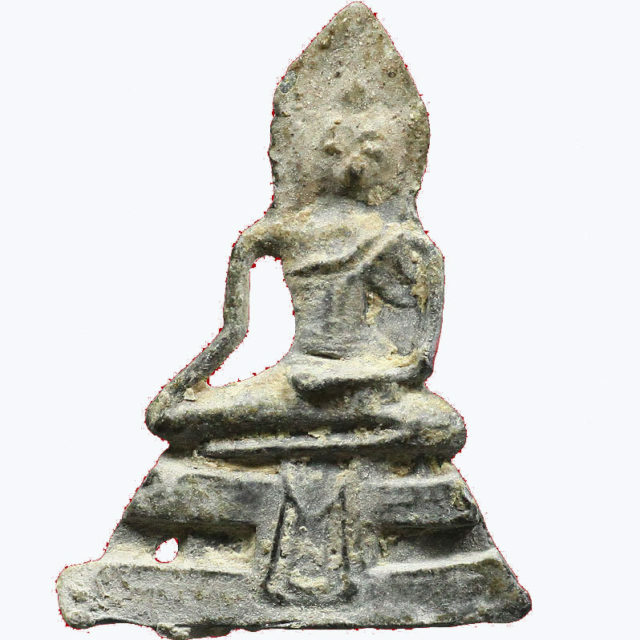 The Pra Kru Wat Geng Jeen amulet find was discovered in the year 2515 BE (approximately), in the old deserted temple of Wat Geng Jeen, in Rayong Province. Despite the fact the temple was in disrepair and without any resident monks, the history of this temple is known and documented. 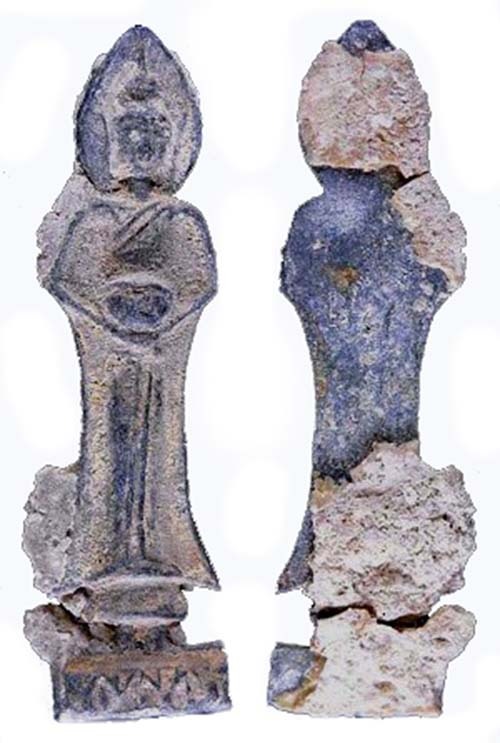 It is known hence, from historical reasearch, that Pra Ajarn Geng was the abbot at the time of the burial of the amulets and made them in over 70 models, all made from cast alchemical lead artifact alloy. 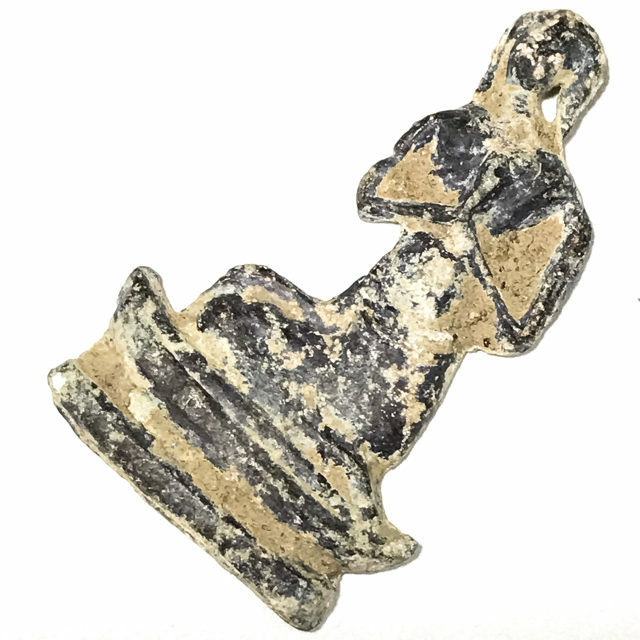 The Pra Kru Wat Geng Jeen amulet find occurred around the year 2515 BE, at the abandoned temple of Wat Geng Jeen, in Rayong, when a large batch of leaden amulets were discovered at the temple. 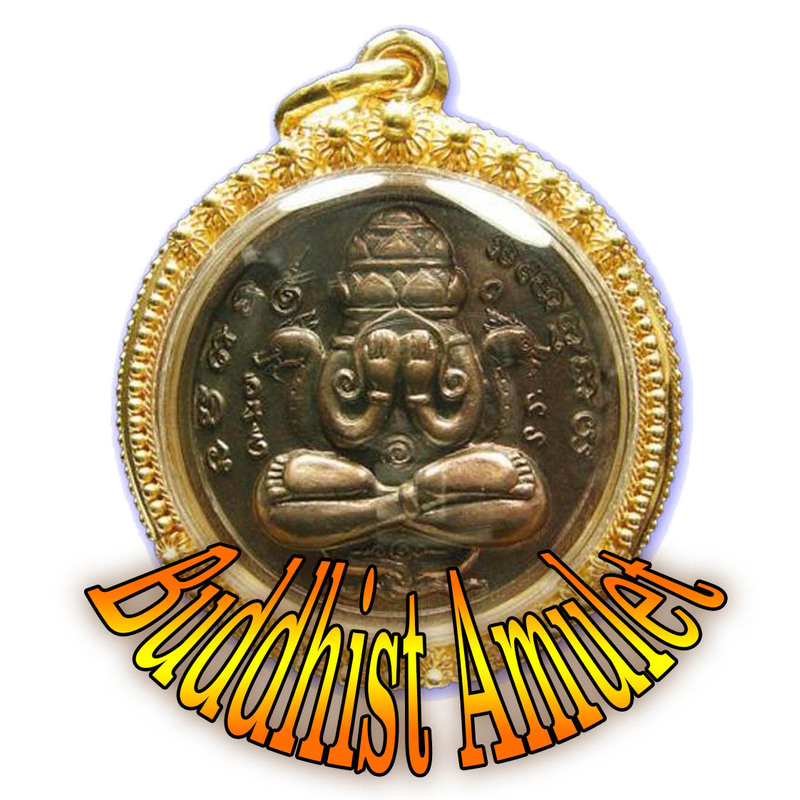 The amulets were created towards the end of the Ayuttaya period, just before the Ratanakosin Era. The amulets were created by Pra Ajarn Geng, who was then the abbot of Wat Geng Jeen. The amulets were found in many different designs and images, numbering over 70 different Pim in all. Some are very common to find still, and others are much rarer. 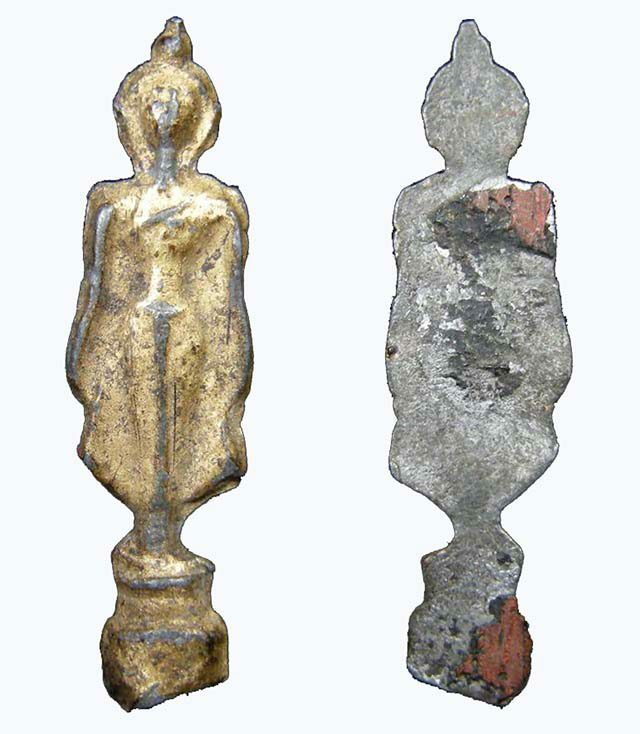 The Kru Wat Geng Jeen amulets are known for their ‘Sanim Daeng’ reddish beige rust forming as ‘Kraap Kru on the front, and that most of them were originally coated in gold leaf in manu cases. The rear faces of the amulets have a fine layer of white cement from the Kru chamber adhering to the surface, which is one of the criteria used for recognising this particula Pra Kru, for they all have some to greater or lesser degree on the rear face. 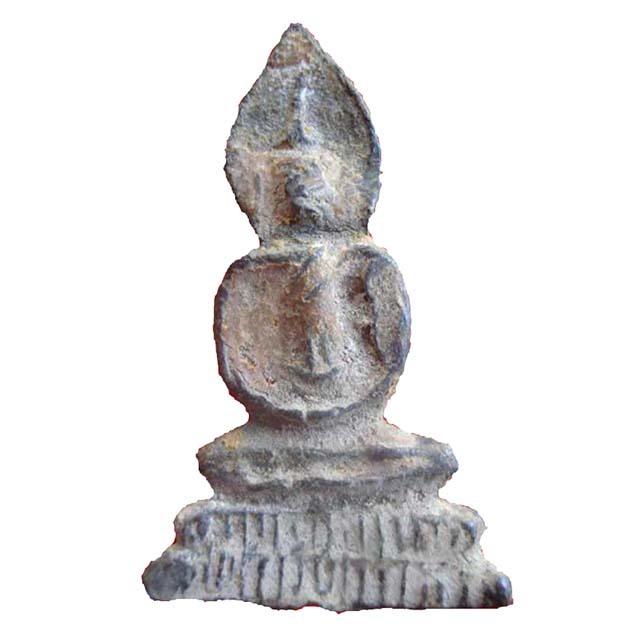 The rarer and more highly sought after models include the Pim Mara Wichai Thaan Pha Tip, the Pim Samati Thaan Song Chan, the Pim Mokkhallana or Saributra (Pim Sawok – praying monk listening to the Buddha – can be seen as either Maugalyayana Arahant, or Sariputra Arahant), and the various models of which only few were found, and are extremely rare, such as the Pra Sangkajjai, Prajam Wan Birthday Buddhas, Pim Pra Nakprok, and the Pim Pra Pratan Thaan Tip. Pra Ajarn Geng, the maker of the amulets back in the late Ayuttaya period, was a famous Kammathana Master Monk of his time. It is believed by experts that Pra Ajarn Geng, the maker of the Pra Kru Wat Geng Jin amulets, was the original Kroo Ba Ajarn who bestowed his magical Wicha onto some of the Great Masters of Olden days we know, such as Luang Por Dto of Wat Khao Bor Tong, Luang Por Am, of Wat Nong Grabork, the Great Luang Phu Tim of Wat Laharn Rai, and Luang Por Tarb of Wat Nong Grabok Kheun Pheung. The words ‘Pra Sawok’ means ‘Savaka’, or ‘disciple’ of the Buddha. It refers in this case to the Arahants Sariputra and Mokkhallana (also called Maugdalyāyāna, and Maha-Moggallana).The image can indeed be used for either of these Arahants, as they are both mostly featured in this sideways praying posture seated either side of the Dais the Buddha sits on under the Bodhi tree.